Owning a lead alloy figurine of a pre-historic hyena makes you the Bell-o'-the-Ball in my social circle. 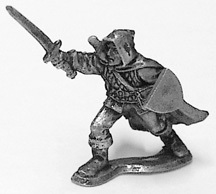 Ral Partha is a miniature company founded in 1975 around then 16 year old Tom Meier. The company has had a tumultuous relationship with Dungeons & Dragons since Hasbro took the reins of the franchise in 1997, but has continued to produce their line of Battletech, Shadowrun and classic fantasy figures in Europe and under the name Iron WindMetals in the US. They are fantastic, varied, inexpensive, and have an old-school feel. Many of the Iron Wind Metals and Ral Partha EU minatures are generic fantasy figures, perfect for Pathfinder or your favorite OSRIC rules-set. Ral Partha's European website does ship to the United States & Canada, but they charge an extra fee for any shipment under 10 Euros.Their prices are reasonable, and with current exchange rates that equals about $13, which I could spend in one fell-swoop. The stateside Iron Winds Metals has most everything the EU does, though, so I would check there first. Fantasy figurines are a dime a dozen (figuratively), but this Bureau Chief is something unique, and I love how he's holding a bottle of scotch.